At one time or another, an authority figure has probably dropped this wisdom on you: Just because you can do something, doesn't mean you should. Like all truly great advice, this can seem a little obvious, but the more you reflect on it, the wiser it is. And if these two men are any indication, more people should consider it. 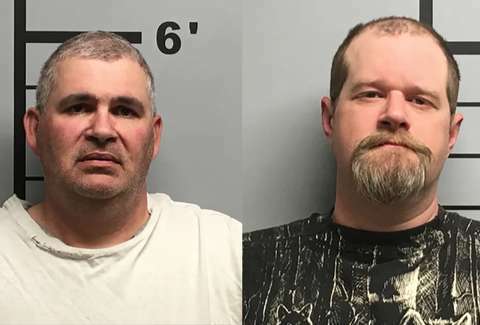 The two men, one 50, the other 35 -- we really can't stress enough that these were grown adults -- were arrested in Arkansas for taking turns shooting at each other in a bulletproof. They were detained, according to Newsweek, the day after the incident, which left a neighbor "alarmed." The night of the showdown, one of the men went to the hospital with a red mark on his chest from a bullet, and, when questioned by police, lied about how he got it. According to his cover story, he'd been paid $200 to protect another man, and when they'd gone to meet a third man, a gunfight ensued. In this high-stakes shootout, shots were traded, and he fled in a car. The truth, according to a version he shared after being confronted, was that the two men were drinking and playing with a .22 caliber semi-automatic rifle and a bulletproof vest. The older man asked the younger man to shoot him. After a first shot left a mark, the man was "pissed" and in retaliation, according to KARK-TV, "unloaded the clip" into the younger man who was then wearing the vest, and shot him five times in the back. “I have three kids, two of them still live at home here… right next to them," a neighbor told 5News. "They shoot as many as 50 to 100 rounds at a time. I just want to make sure it's not just left hanging, no charges. There has to be something done about it. If nothing is done it could escalate into someone getting seriously injured. Maybe somebody that is not on their property." The two were arrested on suspicion of aggravated assault, which could mean six years in prison and a fine of $10,000. But no formal charges have been filed yet.